This Thursday night, multi-instrumental musician Bora Yoon performs at Warsaw for a show headlined by electronic dub supergroup Moritz von Oswald Trio. The event is a joint production between Knitting Factory and Beyond and also features electronic composer Keith Fullerton Whitman. Bora Yoon performs with a collection of conventional and unconventional sound-generators, from her own voice, string instruments, and Tibetan bowls to household items processed through software. One moment she might be singing, while a few minutes later her cell phone sits on a turntable, its periodic proximity to a microphone or a listening ear acting as a visible LFO. This visually performative element underscores her singular performance, which constructs sound environments from a myriad of sources. In anticipation of the show on Thursday, I asked Bora Yoon a few questions via email. Bijan: Describe what you’ll be doing at Warsaw on June 3. Bora Yoon: I’ll be presenting ( (( PHONATION )) ), an interdisciplinary song cycle of ambient electro-acoustic soundscapes, using voice, electrified viola, turntable, Tibetan singing bowls, radios, water, metronomes, musicboxes, homemade instruments, and electronics — and visual artist R. Luke DuBois will be joining me on live visual projections, which will be manipulated in realtime, creating essentially an immersive audiovisual environment and experience. B: How are R. Luke Dubois’ visuals integrated into the performance? Do they affect decisions that you make on stage or do you do your thing while he does his? BY: We essentially do our own thing in tandem — Luke sets up a camera and uses the live video feed from the performance to manipulate in realtime as the performance occurs — creating a sense of time and elasticity, and the idea of permanence or possibility of permanence. Luke is amazing, and a brilliant visual artist in his own right, and considering he programmed Jitter, and it’s his medium, I usually just speak in general terms of the artistic intent and macro arc of the set, and where the set travels to, what textures are involved, and what moods are to be evoked, and we hit the stage. He does what he does best, I do what I believe I do best — and it works. B: As an improviser with a lot happening at once, do you make “mistakes” or is it all just part of what happens? Do you incorporate unintended actions/sounds into the developing performance or just leave them behind? BY: The way I see it, whether it’s improvised, or thru-composed, everything has to fall into step with the rhythm of the moment. So whether it’s planned, or accidental, at its moment of delivery, the performance has to breathe with the energy in the room, so it comes off seemingly ‘new’ every time, and doesn’t seem forced, or too rigid. My compositions are approximately 75% structured: I know the order in which things come in, and the rest is somewhat breathable, within the context of the set, the pacing of the night, the energy in the room, and what seems to fall into place. Whatever happens happens — so when there’s feedback in A-flat, harmonize with it then. B: How does a specific space affect your performance? When you’re not the only musician of the evening, as on June 3, does the bill/lineup have any effect on what you do? 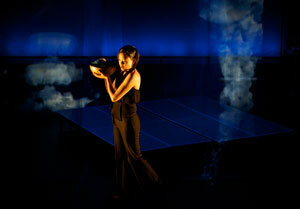 BY: Space and architecture certainly affects the way I present my performance. Music has the dynamic ability to create both inner and outer space for a listener — and I believe that taking a venue space into account, in its presentation and delivery, only augments the dynamism of delivery, to be more experiential, than presentational beyond just the proscenium of a stage. For instance, if it’s a church space, large concert hall, or auditorium, then there’s acoustics to play with, perhaps even history to fold into the repertoire, sense of time, balcony, layout — or if it’s a small space like a blackbox, then I have to create inward space — playing with close micing, the subconscious associations of sounds, and perception of proximity, and sense of scale through effects, and visuals, and lighting. The billing, and the lineup also definitely affects what I perform, as I often find myself in pretty varied scenes: electronic, contemporary classical, multimedia, art world, dance world, etc. Knowing what other performers, kinds of performers, overarching context or theme of the night focuses my instrumentation of a set (if it’s a more classical gig, then I’ll use my viola, more tonal instruments — or if it’s an electronic festival, hen I’ll use my vocoder, synths, etc. ), allows me to anticipate the expectations of the crowd, how to play with that expectation, create contrast, and segue in interesting ways so that the night, not only my set, has a nice ‘bloom’ to it. In essence, all factors work towards creating a kind of rarefaction of experience: from intimate to transportive, by utilizing the perception and scale of sound. B: Do you have a favorite piece of gear, other than your voice? BY: One of my favorites in the battery in the Tiny Orchestra I schlep around with me is an original instrument I made last spring with Brooklyn’s League of Electronic Musicians and Urban Robots (LEMUR) called Subwoofing Spoons. 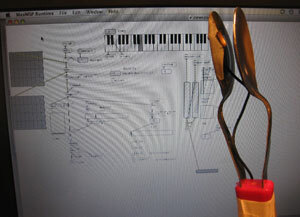 They are a pair of repurposed Swedish spoons amplified with an old violin pickup, and processed through custom software in Max/MSP, to create a large bass subwoofing hit, approximated by its attack. When there’s a sweet subwoofer in the house, it’s quite satisfying to hear — it’s basically having a German industrial rave in your hands. My newest addition and enchantment I am working into ( (( PHONATION )) ) is this Stroh violin, a horned violin from the turn of the century, when recording technology was not sensitive enough at that point to capture softer sounds like strings, and voice — so that they altered the entire string family to sound a bit shriller (akin to an erhu) so they would be able to be heard. I’m drawn to its mutant form, and how instruments are a reflection of the time — and that it was a hybrid prototype of various audio technologies of the time — and is very much a part of the steampunk aesthetic I am drawn to, which is this idea of “ancient future”, and the cyclicality of patterns through time, as we move forward in such a digital age. B: 2003’s Proscenium recording, which I just heard recently, seems like a very different side to your music. How does the experience of recording and performing this type of work compare with something like ( (( Phonation )) )? BY: In a past musical life, I was a classical composer,and folk-singer before I started to experiment more into the sound / noise side of things. Proscenium is much more nascent in my development towards my original sound — and it took the stripping of lyrical and formulaic elements of songwriting to reach ( (( PHONATION )) ) — which is literally means the utterance of sounds into language. ( (( PHONATION )) ) is basically a result of the degeneration from songs to the elements of music, to see what else could take form — and I have to say, it is the most original and honest music I have made, and is more a departure into more the mood, texture, and timbre side of music’s unraveling, focusing further and relishing in the music-side of things — whereas the songs from Proscenium are much more lyrically-oriented and prescribe much more formulaically into what a “song” is. I do however still consider the experimental soundscape works of ( (( PHONATION )) ) to be essentially songs without words — and it’s interesting and bemusing / amusing to me to see what radically different genres and categories I fall under now (experimental / contemporary / electronic) , with simply the removal of words and lyrics. B: I read that you’re creating music for a theatrical production of “The Wind Up Bird Chronicle.” Can you tell us more about that project? How did you get involved, and what “music and live performance” will you be doing? BY: I’m co-scoring and performing the live music for the staged adaptation of Haruki Murakami’s “Wind Up Bird Chronicle” directed by Stephen Earnhart, making its world premiere at the Baryshnikov Art Center next March. I became involved when he was looking for a new composer for the project, through a mutual colleague I had worked with before at BAM and became excited by the project, not only because I am a huge fan of Murakami — but because of its multi-layers of unreality, dream states, and states of consciousness and unconsciousness that I felt I could explore and offer insights as a hybrid composer/composer who draws inspiration from those very invisibles — and also falls within the cracks of many definitions. I perform at the side of the stage — a one-woman orchestra pit essentially — in a cubicle of soundmaking devices and instruments: with a prepared piano on one end — an aquarium on another (to mirror the set), and a table full of goodies which I make music with: Tibetan bowls, metronomes, walkie talkies, zippers, bird callers, bike bells, velcro, chimes, meditation boxes, radios, and electric viola, electronics, and voice. I echo the movements of the characters, I embody the motions and imagery happening in the show through seemingly coincidental movements and performance interfaces that resonate what is being described, which creates a sense of Michel Gondry-esque one-degree-removed synchronicity that makes sense, in a very illogical but intuitive way (much like dreams). I am performing thematic music, as well as live foley, noise, and leitmotifs specific to certain characters, and I’ve carefully chosen which instruments arise when, akin to the imagery described in each section, so that the interfaces of actions are also mirroring what is being described within a certain scene or between characters (i.e. using a bow pulled across my Tibetan singing bowls to create shrieking feedback sounds, during a scene which recalls a man-skinning experience in Manchuria in WWII, so that performatively, the gesture looks like what is being described, though functional in a different way). The show is a rather subconscious rabbit hole of a show — and I am on stage for the duration of the entire show, in addition to a 30-min preshow to set the tone and scene for the audience as they arrive, and settle. What I enjoy most about the role, is the fact that I perform in an in-between world between what is happening on stage, and what is happening in the minds of these characters, and the other multimedia / tech aspects of the show. I love toying of expectations to an audience of whether they should pay attention to me, or overlook me, as an audience would in a classical setting with a conductor of an orchestra pit — or whether I am actually a character, a ghost character, etc. To me, this role is an embodiment of music’s dynamic ability to be everywhere, and nowhere, be invisible and intangible, yet visceral and illuminating. B: What do you have coming up, in terms of specific performances or new works?